Thronebreaker: The Witcher Tales succesfully brings tactical card battles and RPG storytelling together into one great whole. Thronebreaker: The Witcher Tales splits its DNA between that of a card game and an RPG creating quite an interesting anomaly. Initially intended to be the single player mode in CD Projekt Red’s free-to-play card game Gwent, somewhere down the line it morphed into its own separate thing. And, where meticulous RPGs have made the Witcher name as recognizable as it is nowadays, the 40 hours I spent with Thronebreaker made it clear that although different, it deserves its own spot next to them. Set during the Second war against Nilfgaard, Thronebreaker: The Witcher Tales follows Meve, queen of Lyria and Rivia as she attempts to wrestle her lands out of the invader’s hands. No longer are you a lone monster slayer treated with skepticism and repulsion by others. Meve travels with a retinue, that’s always there to offer counsel or chip in whenever the situation demands it. Her subjects hold no reluctance towards her, welcoming her help. Filling her shoes also places you in a different position when it comes to how you approach choices. You’re a human monarch, ruling over every race in your kingdom. As welcoming as others can be, Meve isn’t absolved of criticism nor free of self-doubt, which she inevitably runs into as she tries to calm spirits, mediate tense situations and lead troops. 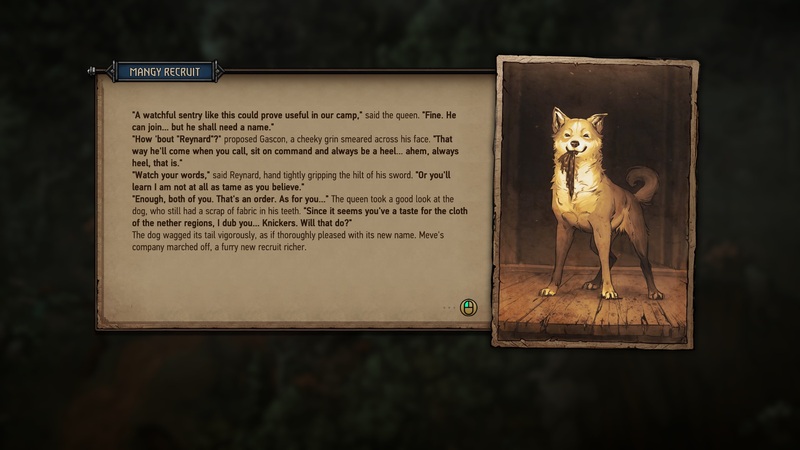 Much like the RPGs before it, Thronebreaker succesfully captures the essence of Sapkowski’s universe. It never shies away from putting misery at the forefront while painting everything in shades of gray rather than black and white. You witness atrocities and face tough decisions. Taking the coin from a freshly liberated village might give your army a resource boost, but will leave already vulnerable villagers with even fewer means of survival. Marching up to a village might lead to witnessing people ganging up on a non-human, saying that he’s a Nilfgaardian spy. Do you give into your compassionate side and risk leaving behind a spy with knowledge of your position or do you listen to cold reason, refusing to take the chance of letting the enemy know more about you? The majority of these smaller choices only pose moral dilemmas that don’t alter gameplay. And yet I still found myself often pondering what to do whenever I bumped into them, no matter how insignificant the characters were in the grander scheme. Major choices largely appear at important junctures in the story, although not exclusively, and they carry a significant amount of weight. Trusting the wrong person can end up stinging later when they betray you, just like the unexpected effects of an early choice become evident only later on. 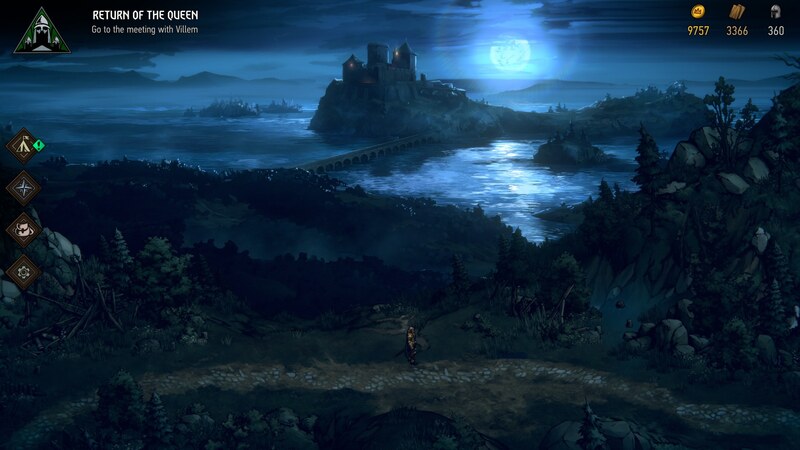 Thronebreaker’s narrative is relayed through both conversation and panels housing a mixture of narration and dialogue. Anyone familiar with the universe will surely tread common ground, but the detailed art alongside quality writing makes unravelling Meve’s story a satisfying experience. Aside from describing scenes and environments in detail, the narrative in the panel is also voice acted excellently across the board. The action in these scenes is then elevated by sound effects which further help visualizing what’s going on. Meve might be portrayed as a capable, strong ruler, but it’s her retinue that shines the most character-wise. Loyal, dutiful Reynard contrasts Gascon the crafty rogue in such a great way that seeing them bicker, but also work together, is an absolute treat. Although the title maintains a serious tone throughout, it allows itself the occasional playful, humorous moment. Despite not being as deep as they, perhaps, could have been, there’s enough nuance to make them figures worth remembering after you’ve seen the tale to its end. It’s a pity there weren’t more opportunities for one-on-one talks in the camp or more fleshed out interactions between the other people you can get to tag along. What’s even more interesting is that the choices you make can determine people to join or leave your army which will, in turn affect your decks. Meve’s journey takes her across wartorn lands, through charred fields, snowy peaks and swamps riddled with danger. These are corners of the world that weren’t portrayed in any of the prior Witcher games. It’s familiar yet oddly refreshing. 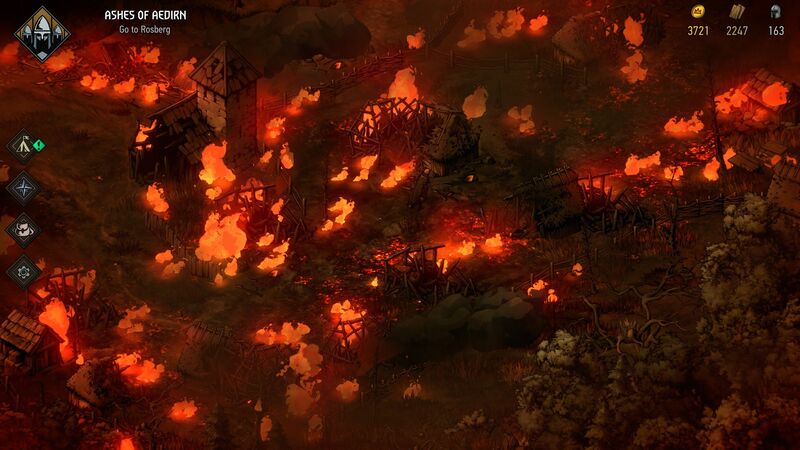 Thronebreaker’s several open maps are free to explore employing the use of an isometric perspective. While you will find obstacles in the road that eventually funnel you down the path to the main quest, plenty of loot, encounters, puzzles and fights await on the side. The art style, although inspired by comic books and colorful, offers a good amount of grit, which works wonders in portraying a world where good things are a rare occurence. Trees sway in the wind, charred fields glow dimly as you pass them by; a layer of snow drapes the screen as you climb mountain peaks, just like crossing a river lets you glimpse at the moon’s reflection – there’s definitely beauty to be found here. That being said, despite differing from each other just enough, areas could have used a bit more variety to themselves. Especially if you take it upon yourself to clear every marker on the map, running around collecting resources also ends up feeling a little tedious after a while, much like clearing Skellige of all its flotsam did in The Witcher 3. Traversal is, thankfully, aided by fast travel beacons and spending a few gold pieces on scouts reveals things of interest in the nearby surroundings. If you’re a fan of Gwent, it’s worth noting that finding hidden treasure chests does reward portraits, frames and animated versions of cards for use in the free-to-play card game. The achievements completed in Thronebreaker also translate to reward tokens which can net you a handful of card kegs and resources there. A trickle of ore, gold and recruits can be employed as a solution to various encounters in the world, like giving dead soldiers a proper burial, but also in upgrading your camp. The camp is where you can talk to your retinue, read reports that help build a picture of what’s going on in the world at large and craft or upgrade unit cards. A handful of building upgrade trees provide the main means of progression, granting access to new cards or better versions of ones you already have. You’ll find yourself spending resources on them until well in the late game. 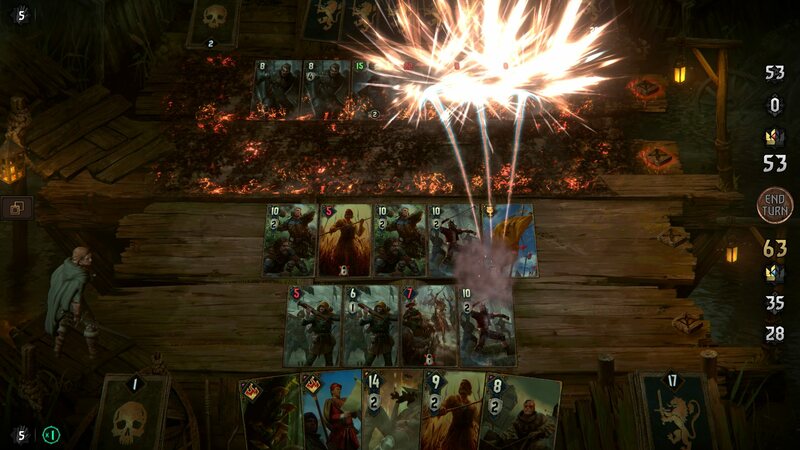 Although based on Gwent’s framework, the card battles in Thronebreaker: The Witcher Tales take liberties with the rules. Players have two rows, ranged and melee, where they can play their cards, most of which have a number indicating their power; passing the turn with a higher amount of power than your opponent marks victory. But Thronebreaker is only a tutorial for Gwent in the broadest sense. Not only are card power values much higher than in the free-to-play counterpart, it also allows itself a bit more freedom that wouldn’t fit into a mode where balance is vital. A hefty dose of synergy flows through the deck which suffers changes as the story progresses. You’ll find it easier to pull off some rather awesome combos that deal steady streams of damage or buff friendly units. On normal difficulty, however, I found myself not just winning easily, but often overpowering my opponent. Only a few fights required me to change my deck around to answer a certain challenge. This also didn’t quite fit with the narrative, where the queen’s army is often tired due to long marches. Meve’s constant talk of exhausted soldiers doesn’t have a means of really impacting the player. Aside from a Morale mechanic that can increase or decrease cards’ power by 1, Meve’s avatar is what represents both her and her army outside of battles. The words kept (somewhat successfully) building Nilfgaard up as this unbeatable foe, yet when on the “field”, I was often wiping the floor with them. This doesn’t really change until the frustrating final bossfight which makes it extremely easy for the enemy to turn the match around based on the luck of the draw. The available cards come with their own abilities. Strays Slingers damage enemies and move them around, which in turn provides constant power boosts to one of the hero cards. Units with the Deploy keyword must use their abilities when played from hand, while those with Order allow you to manually trigger them a turn after they’re played. Get a bunch of Order units alongside peers that recharge their Order abilities and you’ve another deck variant to consider. Monsters rely a lot on consuming allies to get stronger, while Nilfgaard’s decks excel at buffing up their troops and calling others into the field. There’s a good degree of variety when it comes to standard three-round battles. The majority of them, however, are shortened, playing out over just one round. As the deck changes with the story, Thronebreaker throws new cards and synergies your way as you progress. Even if its difficulty never quite requires you to change too much around – I kept the Slingers in my deck from the moment I got them until the very end –, there are enough opportunities to mix, match and get creative with your deck, provided you want to. Besieging castles means you first have to deal with their gates. A standard battle against an enemy force can come to a swift end once you deal with its commander, also working in immersion’s favor. One fight required preventing a wagon to reach the other end of its row. Damaging it took its power down and knocked it back, so I had to figure out the optimal way to use my newly upgraded arbalests which not only attacked when played, but also when Meve used her commander ability. A handful of story battles also give you extra cards to use, which is a neat way to shake things up. The ultimate departure though, lies clearly with the game’s many puzzles. These move even further from the Gwent framework, replacing your deck with a fixed hand. They can ask you to beat a dwarf at a drinking contest, kill a deranged cow while keeping other cows alive, or clear a full board of insects that buff each other upon death by manipulating their health numbers in a certain way. Needless to say, they provide excellent detours from the main path. You always have the tools you need, all that’s required being figuring the right way of using them. I went out of my way to do as many of them as I could, even if the rewards are rarely worth the effort. Detailed as the cards and various boards may be, keeping track of the number of turns left until a commander’s ability gets off cooldown isn’t handled in the best way, though. Their 3D models stand, almost exiled, in a corner, making it easy to forget about them even after a healthy number of matches. Meve’s story is one of triumph and failure, of trust and betrayal, showing just how ruthless its world can be. Whether it’s racism, greed, hatred or subterfuge, you’re bound to have to deal with it, just like you’ll put monster, man, elf and dwarf to the sword. Narrative interludes break portions of exploration and card-based combat in a manner that expertly balances everything out. There’s never too much of any one thing and whether it’s a text-based encounter asking you to choose between two evils, a fight to liberate a town or the next major step in the story, something constantly urges you on. Thronebreaker: The Witcher Tales is a lengthy, epic adventure that not only succeeds at mixing card game with RPG in an engaging package, but is bound to satisfy both those already acquainted with Geralt’s adventures as well as new faces just getting acquainted with the universe.